Voice Thing! puts powerful vocal processing in a simple, cartoon-like package. 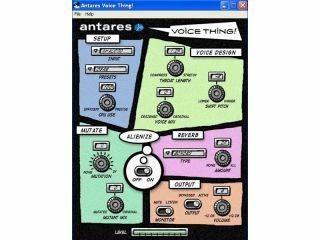 Antares is best known for its high-end vocal processing software - Auto-Tune being the most obvious example - but with Voice Thing!, it´s produced an entry-level product that pretty much everyone can afford. Featuring an interface that looks more like a comic strip than a bank of tweakable parameters, Voice Thing! enables you to change the character of your voice in a multitude of ways. It´s designed primarily for online gaming, voice chat, VoIP, video and podcasting - and also simply for having fun with - but could also be useful for musicians who want to add a different kind of vocal effect to their productions. Features in Voice Thing! include pitchshifting, gender switching and a mutation function that´s said to enable the creation of monstrous, demonic and alternate-species voices. There´s even a ‘translate into alien´ tool, which is sure to appeal to 35-year-old men who live with their parents and watch a lot of Star Trek. To use Voice Thing!, all you need is a computer running Windows XP or Vista, an application that accepts an audio input and a microphone. Sadly, the software doesn´t appear to work as a plug-in at the moment - which could limit its appeal to musicians - and there´s no Mac version, either. However, with some powerful, established technology behind it and a price tag of just $34.95, Voice Thing! has got to be worth a look. You can find out more and place an order on the Voice Thing! website. Just don´t let us catching you using it to make crank phone calls.